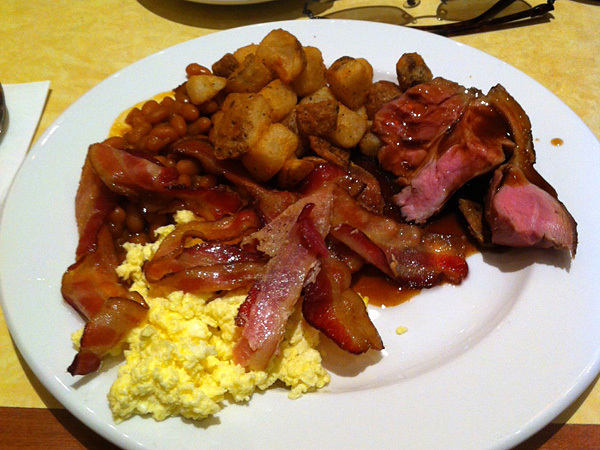 If you’re looking for a place in Ottawa for brunch, there are lots of options to choose from. Kumi and I were looking for something a little more high end though and Denny’s just wasn’t going to cut it. A quick search online brought up a list of some good places to check out such as Eggspectation, Cora’s, Stoneface Dolly’s, and Morala. 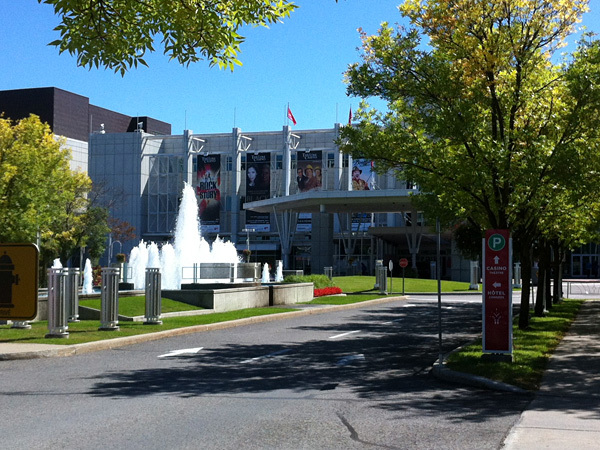 We opted however to go across the border to the Casino de Lac Leamy. Though I’m not a huge gambler I always like wandering around the casino. There are a few of them now in the Ottawa area, you’ve got Lac Leamy across the river as well as the Rideau Carleton Raceway in the South end of Ottawa. Of those two, the one in Gatineau is nicer. The building, the decor, the layout, it’s all fantastic and even if you’re not a gambler it’s fun to just walk around inside and feel like you’re in a James Bond movie or something. Anyway I figured that in such a classy looking place the food *should* be pretty good here so we decided to give it a chance. 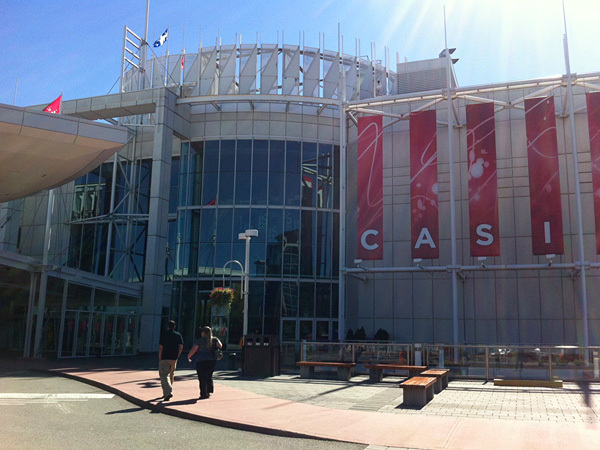 Here's a view of the outside of the casino when you're walking up to it. Unfortunately you're not allowed to take photos when you're in the gambling areas. The casino has a number of different restaurants, each of them more luxurious than the others, but the one that serves brunch is called Banco. I checked out some reviews online and like most restaurants, it seemed to be hit and miss. There were some people who raved about it, and others who described it as the worst experience in their lives. One of the chief complaints was that there was usually a long wait to be seated, sometimes as much as an hour. To be honest I was more worried about a long wait than mediocre food. It turned out we needn’t have worried. We got there around noon on a Sunday but there was no line up at all and we were seated right away. So how was the food? Well it turned out to be pretty good! Not amazing, but still pretty good, and the service was good as well which for me is almost as important as food quality. I grabbed a big plate of bacon, eggs, potatoes, beans and a few slices of roast lamb, and some chicken pie. There was lots more to choose from but I’m not a teenager anymore so I can’t eat like I used to. 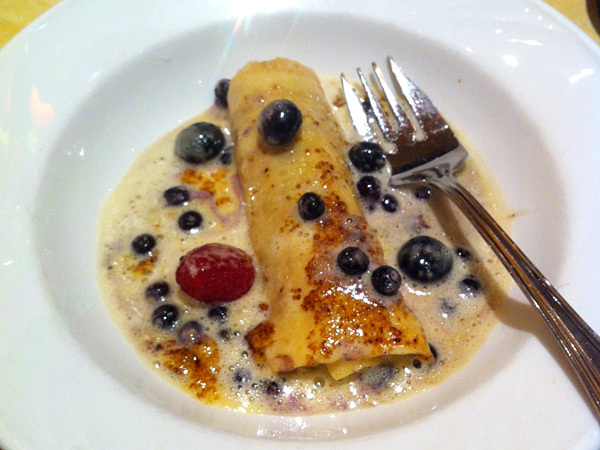 I couldn’t pass up dessert though so I had a stuffed crepe with fruit and a coffee. Then it was time to pay up. Not exactly the cheapest place in Ottawa at $50 bucks for two people (that includes tip and tax) but not overly priced either. This being a casino Kumi and I took a look around after lunch. Every type of gambling is here. Slots of course are everywhere, then there’s blackjack, roulette, poker, craps, as well as variations on all of those. Kumi and I elected to just watch today but I did linger a while at the roulette table wondering if I should put some money down. I once won around $600.00 bucks at roulette on a lucky spin. All in all it was a good day, but the casino is far and not easy for us to get to. If you’re a gambler but not into traveling long distances why not have some fun here?